A sound-recordist on the Arctic tundra! Imagine carrying heavy battery-operated equipment - along with all your camping gear - across the tundra. That's what recordist Gerrit Vyn did on assignment for Cornell's Lab of Ornithology. His mission? 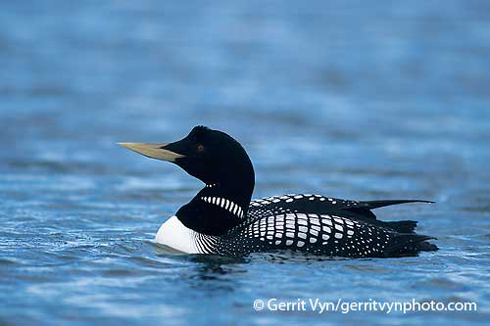 To record the calls of this Yellow-billed Loon. You can learn more about the lab and about The Macaulay Library of Natural Sounds - see Related Resources below. BirdNote is grateful to all the radio stations that carry the show. And thanks, too, to recordists, photographers, donors, and especially the listeners! BirdNote is pleased to bring you this window on nature. We’d like to thank all the sound recordists. We’re grateful to this station for broadcasting the show. And we thank the donors who make BirdNote possible. Most of all, thank you for listening. I’m Mary McCann. Call of the Yellow-billed Loon provided by The Macaulay Library at the Cornell Lab of Ornithology, Ithaca, New York. Recorded by Gerrit Vyn. Gerrit Vyn interviewed by Chris Peterson.